Spec. 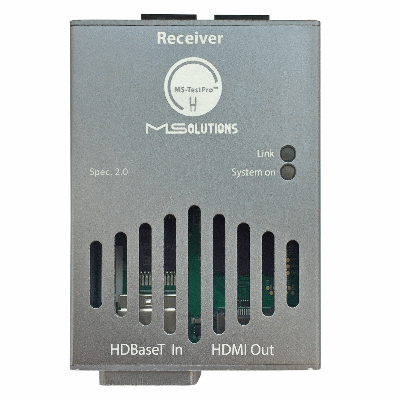 2.0 is the most recent and technically advanced profile for HDBaseT systems. Whereas HDBaseT 1.0 addresses only the physical and link layers of HDBaseT switching, Spec. 2.0 adds networking, switching, and control-point capabilities. Among other enhancements, it improves performance margin and optimizes existing infrastructures and bandwidth. The new Spec. 2.0 module, now available for use with the MS-TestPro, enables our users to test and certify all the added functions and capabilities of HDBaseT Spec. 2.0 systems with the same unsurpassed level of quality and reliability that the MS-TestPro is known for among HDBaseT 1.0 installers and integrators. Please leave your contact information so that we can send you instructions for downloading the manual. If you already have a password, enter it below. Please leave your contact information so that we can send you instructions for downloading the manual. If you already have a password, enter it below with your name and email. Please leave your contact information and we will send you the user manual shortly. Don't worry, we won't use your details for spam.